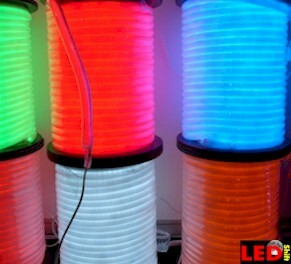 or short known as LED, is an electronic semiconductor -element with a p-n junction. Our German sites are much more detailed then our English sites. So please switch in our Germen sites and use the language translater (top right) with 60 languages. If current flows into passage direction by the diode, then it radiates light with a wavelength dependent on the semiconductor material. At the beginning of the development of semiconductors, stood one scientific discovery, which was for a long time ignored.1876 Ferdinand Brown hold a lecture on current flow in crystals. The conductivity of a pure semiconductor crystal is based on the formation of freely mobile charge carriers: Electrons and electron holes. The electron holes behave like positive charges. The conductivity increases with increasing temperature. It describes his attempts where he found out when he press a metal point on a sulfur crystal that the crystal leads currents good in one direction and the larger the current the better, the flow. In the other direction however current flows only little. Since one knew at that time only Ohm's conductors and insulators, this rectifying effect contradicted all at that time well-known characteristics of the subject and it took nearly 60 years!!! until an explanation of these characteristics could be found. The "electrical valve" found by Brown played then as a germanium crystal detector in the earlier time of telegram and radio an important role and affected later even crucially the exit of the 2. world war! Radar facilities use very short-wave, thus high frequency electromagnetic waves. The radar receivers must receive and strengthen the weakly reflected signals. For this, Brauns crystal detector suits perfect and once produced in masses the detector decided the air war around England. Also the second half 20. century is clearly shaped by the upswing of the semiconductor industry. Electronic circuits revolutionized the working sphere and spare time. By installation a fives valency foreign atoms (donors) we receive more electrons (n - type) and by installation a three valency foreign atoms (acceptors) we receive less electrons (p - type). We assemble a diode now in thoughts. We take one piece each of n - type and p - type material. As long as the two pieces do not touch themselves, they are electrically neutral. In the n - type are many freely mobile electrons and in the p - type are many freely mobile electron holes. That means: Electrons are caught by the holes and bound again to lattice sites. The energy freed thereby is radiated as light. 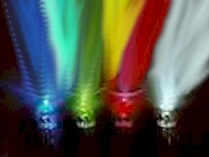 The color of the radiated light depends thus on the material (semiconductor) the Led's. With that most usual manufacturing processes around white LEDs to manufacture, gallium nitride is steamed then again replaced on a bottom layer made of sapphire and again vaporized. Thus develops the first layer GaN semiconductor crystal. In a new procedure of the Birck Nanotechnology center at the University of Purdue the expensive sapphire layer was replaced now by silicon. A coating from zircon nitride prevents that the silicon layer absorbs light. The use of zircon nitride only made possible by one the silicon with an intermediate layer from aluminum nitride covered before, in order to prevent the reaction of the silicon with the zircon nitride. As last layer the gallium nitride becomes vapour-deposited. The substantially more favorable and wide silicon wafers can be used by this procedure for the LED production.